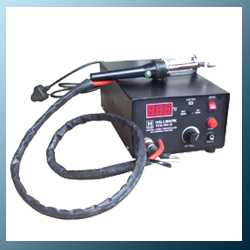 We are Manufacturer, Supplier, Exporter of Digital Temperature Controlled Desoldering Stations, Soldering Equipment. We are offering a wide range of desoldering station that are immensely appreciated in the electronic and mechanical industries. We use the latest technology to manufacture these products to assure an optimum quality and desired performance. Desoldering of electronic components having electrical or thermal sensitivity, like CMOS circuits, FET transistors, LED & LCD displays. Desoldering with high standard to the soldering connections, Military aviation and space research. Desoldering with special solder (High & Low melting) connections, with exact tolerance. Set pot for temp. setting from 200deg.C to 380deg.C having Accuracy ±3deg.C. Polarizing four pin metal connector with proper grip & locking. Ergonomically designed ABS handle & grommet for wire protection. Element fitted with three self threaded screws in handle. Soldering iron with special burn proof silicon cord. High temp. Withstanding glass tube as a solder collector. Also air filter is provided inside the tube. Special diaphragm type long lasting vacuum pump for suction. Easily replaceable and long lasting element.